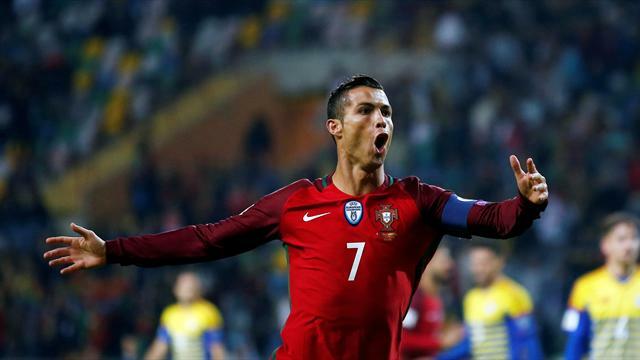 It was the Portugal captain's fourth hat-trick or his country and the first time he has scored four in an international, taking his tally to 65 goals in 134 appearances. It is the first time he has scored four goals in an international game in first match for the national side since he suffered a knee injury in the 1-0 Euro 2016 final loss to France in July. Andorra are minnows, but their cause was damaged by having two men sent off as Ronaldo showed he is far from a spent force after coming under heavy criticism with Real Madrid drawing their past four matches in Liga and the Champions League. He hit the first from 12 yards with a volley before rising to nod home Ricardo Quaresma's cross for the second. Joao Cancelo added the third before Ronaldo completed his hat-trick early in the second half from an Andre Gomes cross. He finished well on 68 minutes from a Jose Fonte cushioned header before Andre Silva completed the rout. "I know I am important as are all the other players. I have always given everything for the national team, I feel useful and I'm happy to be back after that injury in the European championship. There are eight games to go and we want to win all eight to go to the World Cup." Portugal are third in Group B, three points behind Switzerland and a point behind the Faroe Islands.